Everyone was very professional and friendly. Not overly pushy. They had the car ready fo us to test when we walked in the door. Great overall experience. 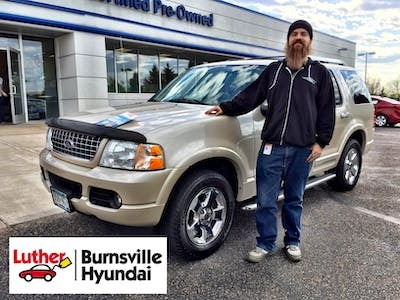 I would highly recommend Luther Burnsville Hyundai. The sales people were warm and friendly, never felt pressured, and we became very satisfied with the negotiations and the wrap up of our deal. 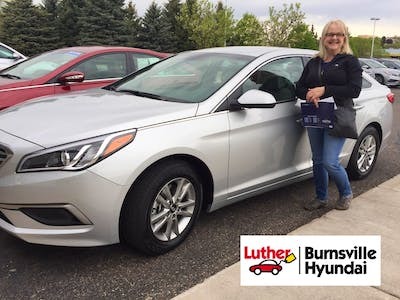 It was a new experience for me buying the certified Hyundai sonata. Car is like a brand new for reasonable price. Staff were very friendly and knowledgeable. Thank you for the great car. Galen is excellent and that is the reason why I came back to this dealership. An interior cleaning should be done better before delivery the vehicle. I worked with Roberta and she was so helpful and sweet. 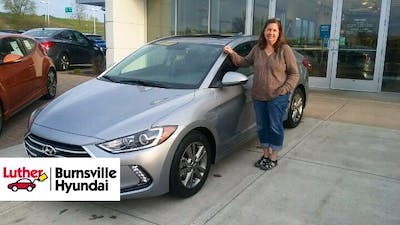 I asked to have Weather Tec floor liners thrown in for the front of the car as I had those in my Sonata that I had leased before, I now got an Elantra and those floor liners would not fit my new lease. Since I paid for those floor liners, I wanted them to throw in new ones that would fit the Elantra and they did. Plus Roberta showed me how to hook up my phone to Apple Car Play. We had a great experience all the way around. Charlie, the Genral Manager helped us personally, which was great. The dealership had a great play place and TV set up which made it easy for us having two small kids with us. Will highly resommend. No pressure. The staff took time to understand our needs and worked together to allow us to make a decision. Everyone coordinated to serve us from start to finish. 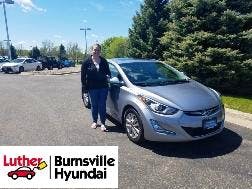 I have already recommended Burnsville Hyundai! My car buying experience was very smooth. No hassles, no pressure, friendly knowledgeable staff. My questions were addressed in a professional manner and it was better than most of my car dealership experiences. Very pleased with my first Hyundai car. I had a nice experience buying my car with my salesperson Rich. I was going to shop around but bought a car at my very first dealership. Would definitely recommend to everyone! The first word that comes to mind is SEAMLESS!. I was so impressed by how smooth the whole process went. After discussing by phone what I was looking for, to setting the appointment, test driving, and financing, the process was easy. It took 2 hours. I definitely recommend checking out their capable sales team. Linda is very attentive to detail and to any questions. She checked on us frequently during the process. We needed to wait for the trailer hitch that we had installed and that was made painless also. 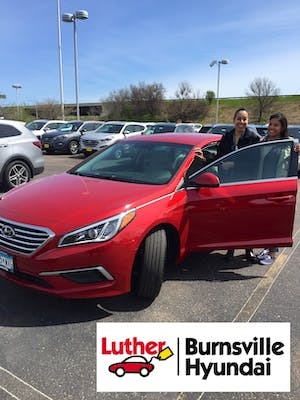 The team at Luther Burnsville Hyundai was very helpful. From sales to service they have been wonderful! Showed me how to run everything including connecting my cell phone and helping me set it up. The service team did a great job applying sealants and extras to the car. Made sure it was very clean as well. Thanks!!! I went in to this process not knowing a lot, but left with a new car and no questions or second thoughts. 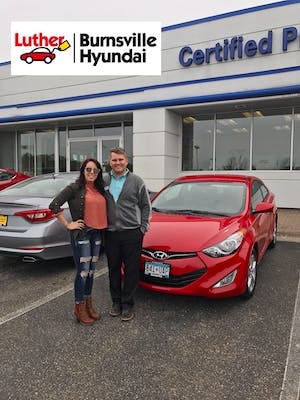 Leland was extremely helpful and spent a good amount of time making sure the car was something that would work for me and that I was happy with it. My experience with Galen at Luther was fantastic. I told him my budget and he stuck with what I was looking for in regards to budget and type of car. I will definitely be back for the purchase of another car in the future! Galen was great to work with, very friendly and knowledgeable. They handled financing quickly and easily and even got me a better APR than my bank. Thank you Greg! you did an awesome job for us!! 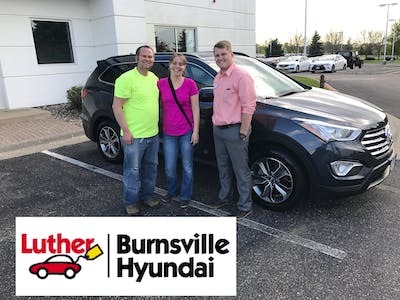 Greg helped us get our new SantaFe and we love it, he is a great salesman and very personable when dealing with clients, we are very happy! I had a really good experience purchasing my new-used car. Everyone was super helpful, but I didn't feel pressured like at other dealerships. I was very stressed about everything, but everyone was super helpful and kind. I felt like I was purchasing a luxury vehicle with the way everyone was treating me. Dawson is a great salesmen! He has patients and truly cares about you. He found me a great car at an awesome price! So thankful ! After a not so good diagnosis on our old car, the whole team worked with my husband and myself to get a new vehicle. Everyone was kind and respectful of our choices. Big thanks to everyone from the mrchanic, detailer, Dawson, Jennifer, and the manager. Chad and the rest of the service department have always exceeded my expectations! 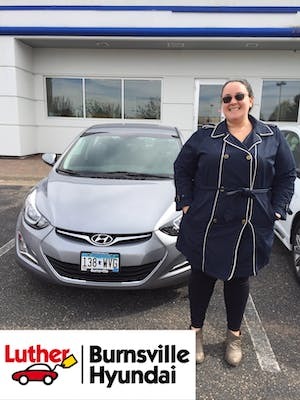 Galen and the team helped me lease my second Hyundai vehicle. I got just what I needed at an affordable price! Tony an Jennifer were also very helpful and knowledgeable. 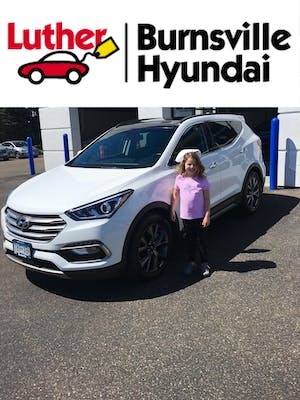 My buying at this burnsville hyundai dealership was very fun experience. The dealer was very helpful on any question that i had. This is the first time i bought Hyundai car. And i'm very pleased on this purchase. 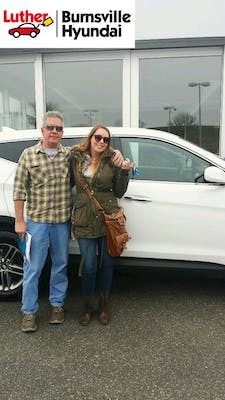 I have purchased new vehicles in the past and was impressed how the salesperson was only concerned about getting me the information I needed to feel comfortable buying my vehicle without being to pushy. Bought a Lincoln from Luther Hyundai. Can't say enough positive things about Galen and the whole staff. The price was well within reason to boot. 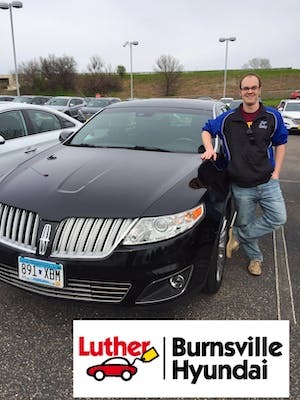 Employees were all great, I have worked with Luther for 8 years through other car purchases and services. They are always courteous knowledgeable and eager to please. I had been looking for a new to me car and test drive everything anyone could. I test drove and elantra earlier in the week that sold right after so when the next great deal for one came through I hopped on it. Galen walked me through the whole process and I never felt pressured to buy. He understands what it likes to be a guest and how intimidating that can be. Overall it went smooth and was relatively painless. Great experience from start to finish. Highly recommend. Will buy from again! Very fast service, appt. was completed before the scheduled time. I came to Luther Hyundai looking to find a way out of a used car that was costing me thousands in repairs. I had been to 2 dealerships previously and had no luck finding anything. 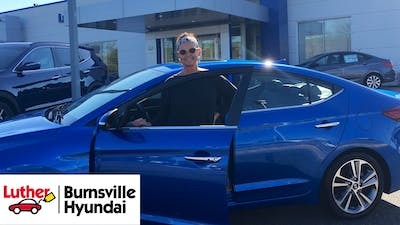 Thankfully, Linda worked really hard to help find a way out of my old car (trade) and got me into a brand new car that both my wife and I love. Thanks Linda. We were very impressed with a Rich and his knowledge of the vehicle we were interested in. He answered all our question and explained in away we could understand. We called with a question the next day and he return our call and help us solve our problem. 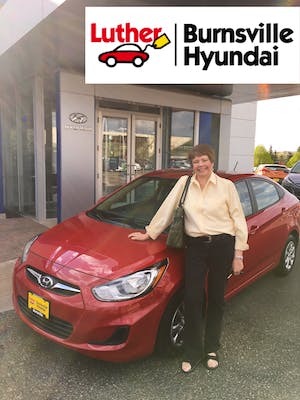 Linda helped me lease my first vehicle, she was extremely inviting and helpful and answered any/all questions. There was a good amount of communication throughout the process so I knew what was going on. 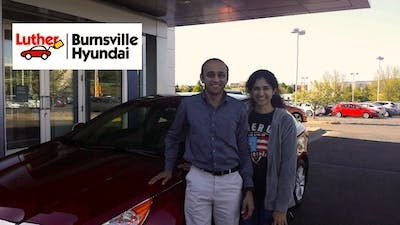 Spent 4 plus weeks searching for good dealership & cars; when I came to Burnsville Hyundai I got the ultimate experience! I loved the patience staff provided & the great timely service to help my trade in! Thank you! I had a very good experience returning my 2014 lease and getting a new lease car. Greg Gagne was very helpful in giving me the information I needed to make my decision on which car to choose. Purchase process was fairly easy, with help from a great staff. Questions were answered, options explained, etc. Best part was no unexpected "surprises", with everything pretty much straight forward, at least from our perspective. Overall it was a very good experience working with Scott and the Burnsville team. Everyone was easy to work with to ensure a good car buying experience. Any time that I've been in for service, with either of the Hyundai's we own, if Bjorn has helped me out things always go well. Bjorn is clear and concise about what is going on and is quick to find me if any questions arise or just to let me know that they're done with my vehicle faster than expected. 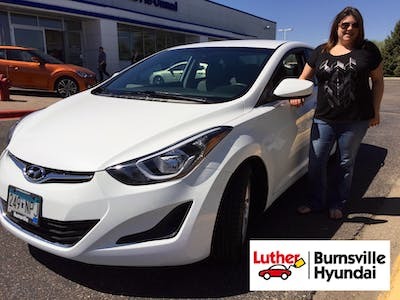 I highly recommend both Rich Kim and Burnsville Hyundai. Returning my leased car and getting into another one was a breeze. They certainly will continue to get my business! The dealership asked the right questions to determine the right vehicle for me. The sales staff made someone was helping us even when Galen was busy with other customers.